For some reason, beans don’t make it to our dinner table very often. Although they’re high in fiber and a healthy alternative to meat, they’re just not on my radar. Our good friends, Felix and Bruce, host us for dinner on a regular basis. Felix, a first-generation Cuban-American and an awesome cook, makes black beans every week and serves them to us on a regular basis. Each time we eat them, I’m reminded that I need to put beans into our dinner rotation. So this week I did just that and set my radar on red beans and rice. If you read my blog regularly, you know that I have ties to south Louisiana and its creole and Cajun food. In addition to visiting relatives there, I went to college in south Mississippi and spent a great deal of time in New Orleans. Believe me when I say I’ve eaten many bowls of this classic Louisiana creole dish in my life. As in many creole and Cajun dishes, this recipe starts with the holy trinity of creole food–onion, bell pepper, and celery. If you were going the purist route, you’d start with dried beans, soak them, and simmer them for a couple of hours. I decided to go the quick and easy route and use canned beans. I’m not a huge fan of canned vegetables, but I think canned beans and tomatoes are great time savers and for a dish like this they work just as well. To keep this recipe healthy and lower in fat, I used turkey andouille sausage instead of the pork version. So rather than spending more than two hours preparing this dish with dried beans, you can make this recipe in about 45 minutes and have a delicious weeknight supper. 1. Brown bacon in a large Dutch oven or soup pot over medium high heat. Add olive oil, onion, celery, bell pepper, and garlic. Saute for 5 minutes or until onions are translucent. 2. Add kidney beans, tomatoes, chicken stock, sausage, paprika, oregano, thyme, bay leaves, salt, and cayenne pepper. Bring to a boil, reduce heat, cover and simmer for 30 minutes, stirring occasionally. If beans get too dry, add additional chicken stock. 3. While beans are cooking, measure 3 1/2 cups of water and pour into medium pan. Add rice and bring to a boil. Reduce heat, cover, and simmer for about 12 minutes or until all water is absorbed. Remove from heat and keep cover on pan for 5 minutes. 4. Spoon rice into serving bowls and top with beans. Garnish with scallions and serve immediately. Here is Riccardo from italy! Dreaming the True detective luisiana’s atmosphere, i’ll Cook this goodness! Thank you! I am going to try with diced chicken instead of sausage. I love the recipe, but I have a picky eater. gotta mash them beans with a potatoe masher after cooking, to give it body. Great suggestion, Charles. Thanks for dropping by! Folks used to eat red beans and rice ALL DA TIME when I lived in New Orleans but I just never got into it. I need to give them a second chance and your recipe looks like the perfect way to do it. Thanks, Bill! What a delicious looking red beans and rice! You sure you aren’t south Louisiana boy? 🙂 I try to make at least two bit pots of bean a month, but I haven’t made red beans and rice in over a year. It’s starting to get cold, so it’s time to change that. Love your recipe! I’ve always wanted to make beans and rice! I think this is the perfect recipe to try out– I will be giving this a try soon. Thanks so much for dropping by, Renee. Let me know how you like it. I love beans, but I have never tried Red Beans and Rice. Pardon me, but I when ever I hear about this dish I think of the musical artist Sir Mix-a-lot, and his song “Baby Got Back”, some of the lyrics to which are “…red beans and rice didn’t miss her…” Oh my, you know how it is when you get a tune in your head! Your dish looks fab! We like beans, a lot, and eat them fairly frequently, especially during the cooler months. 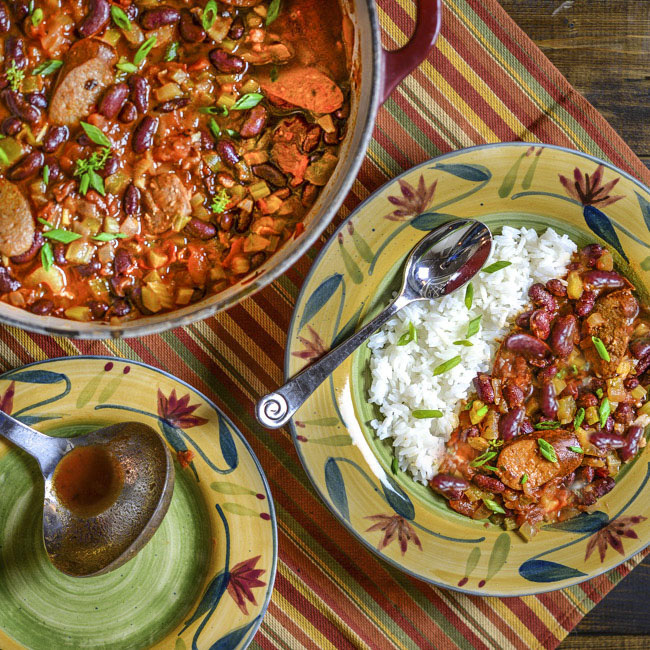 Red beans and rice is such a wonderful classic! This easy version looks really good — thanks. This looks way too good! I seriously just pinned this to try asap!